One of William Shakespeare’s greatest comedies will be coming to the stage in Sleaford in May - and excitement is brewing already! Sleaford Little Theatre presents Twelfth Night at Sleaford Playhouse from Monday, May 6, to Friday, May 10. Twelfth Night explores the themes of illusion, deception, disguise, emotional pain and the extraordinary things that love can cause us to do. 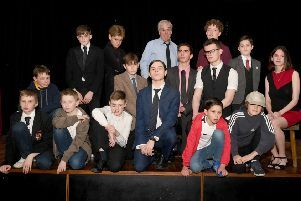 Sleaford Little Theatre’s version of Twelfth Night is adapted and directed by Maria Bates and will be part of the Sleaford Live Festival 2019 that is taking place during May this year. Ahead of the opening night, Sleaford Little Theatre will be entertaining crowds at the Emerge Boston Festival, in Central Park, off Thorold Street, Boston, on Saturday, April 6. The cast will take Twelfth Night to the festival - which will include music, performances and activities inspired by William Shakespeare. Performances of Twelfth Night are at 7.30pm each evening. To book tickets, visit www.sleafordplayhouse.co.uk or call the box office on 0333 666 3366.